Although not especially my favorite (see below), this 36 hole course is always nice and windy as it is located along a small mountain ridge that overlooks the city of Chunburi and with views of Pattaya Bay possible from the higher elevated holes. The 2 courses are of a split design, one being a resort course (A-B) with wider fairways and a large park like setting. The second 18 is the championship course with tighter holes and more obstacles guarding the greens. Both 18’s were in average playing conditions, the greens were especially fast though as they were rolling a speedy 9.5. On holes where your ball landed above the pin it was nearly impossible to par, unless your first putt found the exact center of the hole. That is because all of the downhill putts picked up so much speed on the way to the hole, that they just seemed to zip by ending up 10 feet or more past the hole. This necessitated a steady comeback long uphill par putt. Other than the greens, the course was in below average condition. Fairways were very dry and the tee boxes were for the most part an afterthought and poorly maintained. Many times I found my stance for my drives on uneven tee areas consisting not of grass, but sand. Someone should make a concerted effort this year to upgrade the tee boxes to match the excellent quality of the greens. The other aspect of the course that always bothers me is the compulsory cart rule. Besides preferring to walk myself, this Burapha custom I find rather silly. There is no reason for this policy other than the course trying to make a few extra baht off the tourists who come to play here. The course layout is not so demanding that using carts would make play any faster, nor do the carts add to the enjoyment of play. 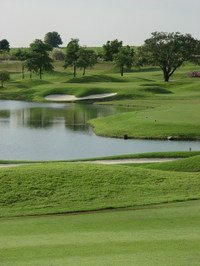 Burapha management should take a cue from the other excellent courses nearby, like Kaew Kheow Country Club and have carts optionally available to those who prefer them. This would be a much better policy and bring in more golfers who place a higher value on nature and value, then high on priced carts and snobbery!